There comes a point in a growing business’s life where working remotely is no longer an option. And this is a good thing. As your business begins to expand, so too will your profits and responsibilities. But when do you know if you’re ready to find a serviced office or co-working space for your team? Meeting clients at cafés is no longer an option, that it just isn’t a suitable “professional” environment. Your team has grown considerably, and requires more face-to-face time on a regular basis. Your team’s productivity isn’t as high as it could be, particularly when working from home or remotely. 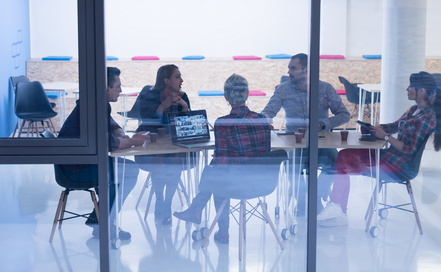 A designated place of business, such as serviced offices, or shared office spaces can offer a lot of benefits to help your business accelerate its growth and work more efficiently. Stronger relationships between you and your client due to increased face-to-face time and a more professional office space to have discussions. If renting your own private office suite is not an option, a shared office space or a coworking space is a great option for small teams. Here’s our guide to both, and how to choose which option is right for your business. A serviced office, also known as an executive suite or a share office, is a bit different from a coworking space. A serviced office space is fully furnished and equipped, and is ready for a quick setup. They usually house corporate businesses and established but smaller teams. In some instances, serviced offices can range from providing single cubicles, to multiple offices, to conference rooms and kitchens. Most will provide occupants with telephone access, internet, and mail services as part of the lease, and the rent will be more affordable than a traditional, private office space. Some shared office spaces also include business equipment like fax machines, copiers, audio-visual equipment and office furniture. Coworking spaces are hot spots for techie entrepreneurs and freelancers, both in Melbourne and abroad. Melbourne has over 30 coworking spaces, and they’re each different in terms of amenities, services, occupants and atmosphere. While some are more casual and come equipped with ping-pong tables, and hold regular Friday night drinks and community lunches, others are suited to intense concentration, and are preferred by those well past the start-up phase of business. Coworking spaces are aimed at lean start-ups, entrepreneurs seeking community and connection, and freelancers looking to increase their productivity away from home. There’s a focus on a sense of community and sharing resources, and they often have a lively, dynamic atmosphere. 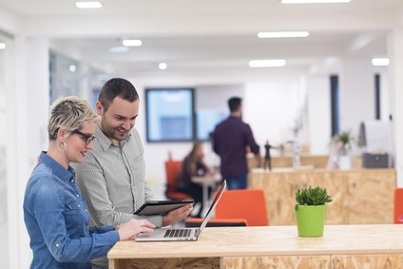 If your business would benefit from connecting with others and a high-energy atmosphere, a coworking space might be for you. It’s possible to hire a set of desks, a single desk, or make use of hot desks on a casual basis. Arguably, one of the best coworking spaces in Melbourne CBD is the NAB Village – it comes free of charge for a small team with any NAB business banking account and with great contemporary fittings. You’ll eventually outgrow it, but it’s not a bad place to start. Does your team need to meet with clients occasionally? If you just need a meeting spot for clients outside of your neighbourhood café, consider renting a meeting room instead. Does your team need to increase their productivity, but doesn’t really need to meet clients face-to-face? A set of cubicles at a shared office space, or rented desks at a coworking space might be best for your team. Do you need a single cubicle or an entire office? What amenities do you need? Meeting rooms? Office equipment? A receptionist? Some shared offices can provide these administrative services, saving you the expense of hiring additional staff. If you have regular meetings, how many people attend? If you’re going to have meetings with several stakeholders on a regular basis, look for a serviced office space with multiple conference rooms. What’s in your budget? Can you commit to a long-term arrangement to attract a lower fee? How long will you need the space for? A few days, a week, or permanently? Make sure you check the terms on any lease before you sign it. It’s just as important as a residential tenancy lease. Is there room for your company to grow? If you can see accelerated growth on the cards, make sure your chosen office space can facilitate this. Is the location convenient? Is there parking nearby? What about public transport? If you’re making the move from working remotely to choosing an appropriate office space, it pays to do your research first. Make sure you and your team visit each shared office or coworking space first, and consider more than just the cost per square foot. We guarantee your business will be all the better for it. HKC Property Consultants can help you find the best working space for your company’s needs. If you want the benefits of our comprehensive experience and knowledge of Melbourne’s commercial property market options, get in touch today. We’re can help your business grow!